The Gardner engine was totally refurbished and a larger than average weed box has been fitted. There is a domestic stainless-steel water tank that can be coupled to the engine to supply hot water when the engine is engaged during a voyage. Twin 250 gallon diesel tanks situated port and starboard keep the engine supplied. Diesel filler outlets are located on each side of the ship. The conversion of the vessel has taken into account the present owners desire to make her not only a very comfortable live-aboard but also a sea worthy vessel as depicted by her bespoke fit out with top of the range materials with all furniture and fittings being ‘bolted’ and ‘fitted’ into place to allow for sea voyages. A full documented record of every step of the conversion depicts all the many areas of work that are now covered by panelling. Her steel coach roof incorporates six 12mm laminated glass roof lights with lockable steel shutters. Three of these are triple glazed for heat retention. The other three are winterized during the winter with king span pads. She has a solas class B (deliberately downgraded from an A) life raft. Held in place by a stainless-steel carrier (this will need servicing for any long journey). She has had extra centre bollards for ease of handling and these along with the man wire stanchions are maintenance free stainless steel. 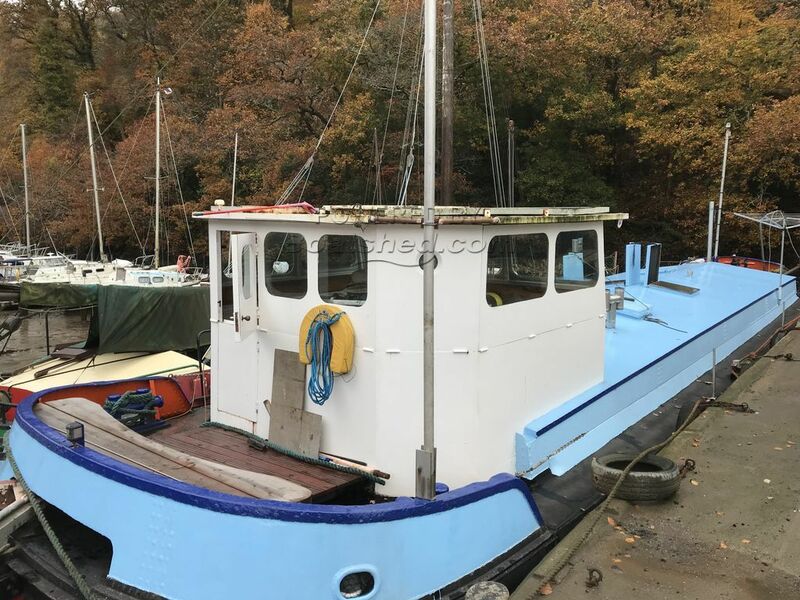 Her hull was purchased from Victor Waddington of Swinton as an empty shell, following a fifteen-year search for a strong straight hull worthy of conversion. Waddington’s had removed the strong beam and the many amendments they made to compensate for this made her one of the strongest vessels still afloat. The combings were gusseted, the side decks doubled, the bottom was over plated and eight internal steel supports were fitted along the length of the hold. The current owners made the decision to have the turn of the bilge plated well in advance of future requirements. She has been shot blasted internally to eradicate years of bitumen and was then sprayed with an inert polyurethane spray foam friendly undercoat. The polyurethane spray foam was professionally done, with extra thickness applied to all surfaces, including the engine room to deaden any engine noise during motoring. This Humber Keel has been lovingly converted to an exceptionally high standard during 20 years of current ownership. She originally served on the Humber and was built by Dunstans of Thorne for Hodgsons Tannery in 1945, although she was launched in 1946. All works commissioned and overseen by current owners (a former mechanical engineer) to the highest engineering standards. A stunning livaboard with some finishing touches left, so plenty of opportunity to make into your own home. This Humber Keel Sheffield Class has been personally photographed and viewed by Jerry Harper of Boatshed Dartmouth. Click here for contact details.